Sorry, but image on the top of page is definitelly not 80×60 pixel! Anyway, good idea, good progress. The sensor is 80×60, not the display. The trick is to properly overlay the (lower resolution) sensor image over a real image. The FLIR offerings do the visible overlay, but this project does not (in fact it does not even have a visible light camera). The cover image of the project/article have nothing to do with the lepton imager. The images you can expect will be the same as any other of the dozens of lepton based thermal imagers. I’ve got a FLIR that does that and I don’t care for it at all. Half the time, the overlay obscures the thermal detail I’m trying to make out. Worse though is the parallax effect, where the two cameras aren’t taking the image from exactly the same angle, so the overlay is almost always off a little. There is a way to manually adjust it, but it’s not worth the trouble. You can turn the overlay off, but it defaults back on when you reboot the device. FLIR also seems to market their devices as having much higher resolution than they do, citing the visual camera over the thermal one. With creative optics, they could align the cameras perfectly. Or they could have a distance sensor that adjusts for the parallax effect dynamically, or they could allow me to save the overlay-off setting between power cycles…. I also have a Flir one and love the overlay, haven’t had significant issues with the parallax. I find it useful to be able to see the visible structure as it shows obviously a lot more detail and nevermfound it to obscure the IR image. Sorry , hardly worth the effort as a potential product. I mean, smartphone based thermal imagers are available for less than this would be on a retail shelf, and perform far better. Nice job as a project…but far from a product. It’s also pretty straightforward and cheap to build one yourself out of a Raspberry Pi and a Lepton breakout board. Cheap? How is it cheap? The Lepton breakout board is $35 USD (for just the board) and then you need the actual sensor, which according to DigiKey the cheapest 80×60 9Hz sensor is $175 USD! So unless you know of a supply of Lepton sensors that fell off a truck, Wizard is right and smartphone based imagers will be cheaper. Unless the guy who built this thing in the article is stealing them, he also needs to buy the Lepton, so you’re comparing apples and oranges here. totally agree. Whilst its quite a nice hack/project effort, its not a product that I would buy. I don’t see how it offers any kind of functionality you can’t get in existing commercial devices (which I imagine will be cheaper to buy). Why does he want to take a thermal picture of his pocket? This: We use a lot of thermal imaging equipment of various scales in the lab (including one of Max Ritter’s, referenced elsewhere in the comments) and I’ve been waiting for the knock-off floodgates to open as it appears to have done. FLIR (the company) has kept the IP of their products tightly held and thus their profits intact (wouldn’t you?). This has slowed development and implementation by several fold and has made hacking/tinkering a pricey proposition. My guess is that the components in the handheld units shown in these ads (that are apparently all from the same source) are being similarly protected to an extent, but the rest – availability of low volumes of bolometers (sensors) and other components – is a matter of time. As the the cost of the bolometers drops and the community of users grows, things are likely to get a lot more interesting since you can measure any number of kinds of radiant energy with these and they’re used in all kinds of interesting stuff. Backyard microwave astronomy, anyone? Absolutelyspamming/automation you are easy to recognize… Just stop! From my knowledge Max Ritter was the first person who used the flir sensors to create a standalone thermal cam solution. 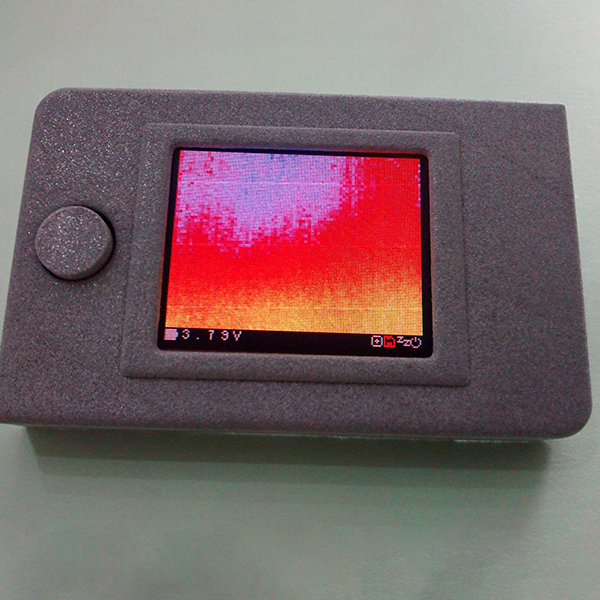 By version 2it supports Lepton 3(160×120 thermal resolution) and picture overlay using an integrated vga camera. I have built this using a kit from groupgets and i can definetively recommend it! higher res OLED and upgrade to the new sensor. It’s an attractive project. I’ve needed one of these for a while for detecting surveillance devices.